07/18/13 – The blades should be done at the laser cutter next week. I have been working with the laser cutter very closely and we have developed a fantastic way to the the most accuracy from them as possible. The results are fantastic. The 2 body parts, inserts and custom stainless nuts are all being made right now. The nuts are being made on a swiss screw machine. These machines are lathes that are just really fancy and specialize in high volume small turned parts. Check out this video of a screw machine in action. Be sure to crank up the music too. 08/08/13 – The blades are in. I need to get them bead blasted and lasered. The Stainless TS-2v2 are being milled and I should have some for the Museum Opening and Open House next week. 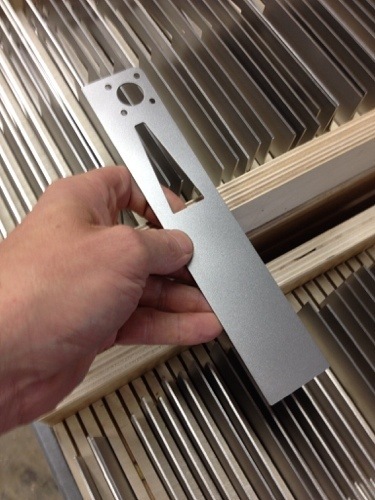 08/22/13 – Samples in AL and Stainless are in hand. They look great. Lots of positive feedback from people who saw them last week. 09/05/13 – Lots of parts in. Nuts are done. Blades are off to bead blast. I made racks for them this week. The Inserts are in, and need to go to anodizing. 09/12/13 – Bead Blasting is in process. The Inserts are getting anodized, and the rest of the parts are being machined still. 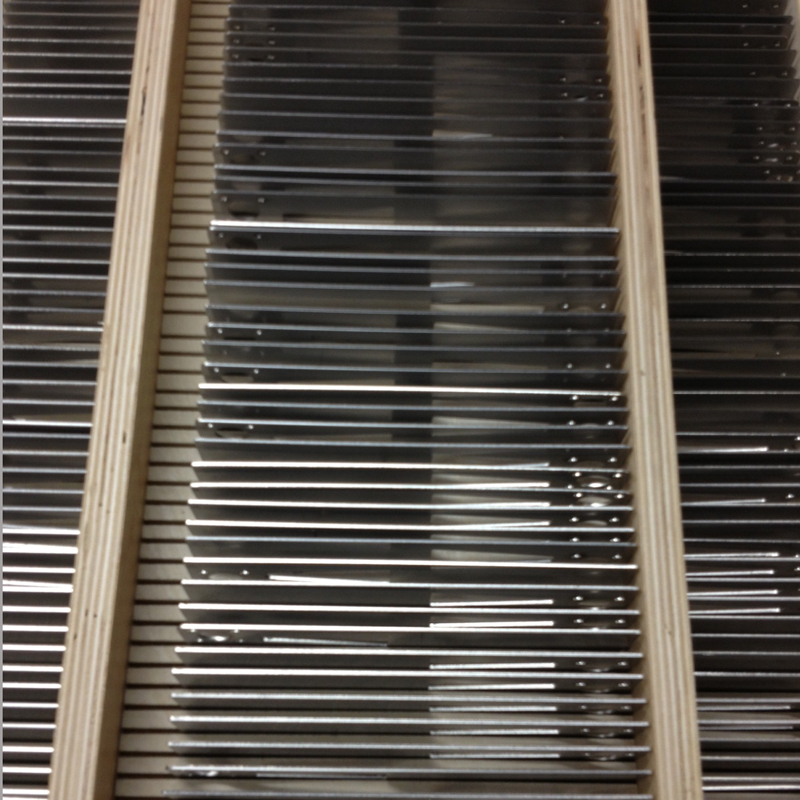 09/19/13 – Stainless handle components are being machined and wrap up in 10 days. 30 halves of the square can be completed in a day. Half of the aluminum squares are machined. 2 weeks for the other half. The inserts are done with anodizing. Bead blast is still cranking along. 09/26/13 – Most of the blades are back from bead blast. They look amazing. Check it out. At this point, these should ship by the end of October. 10/03/13 – The blades are at the laser facility and will be starting up on them next week. The stainless bodies shipped out to me today. These are made in southern Oregon, about 5-6 hours away. They have another week or 2 on the aluminum. 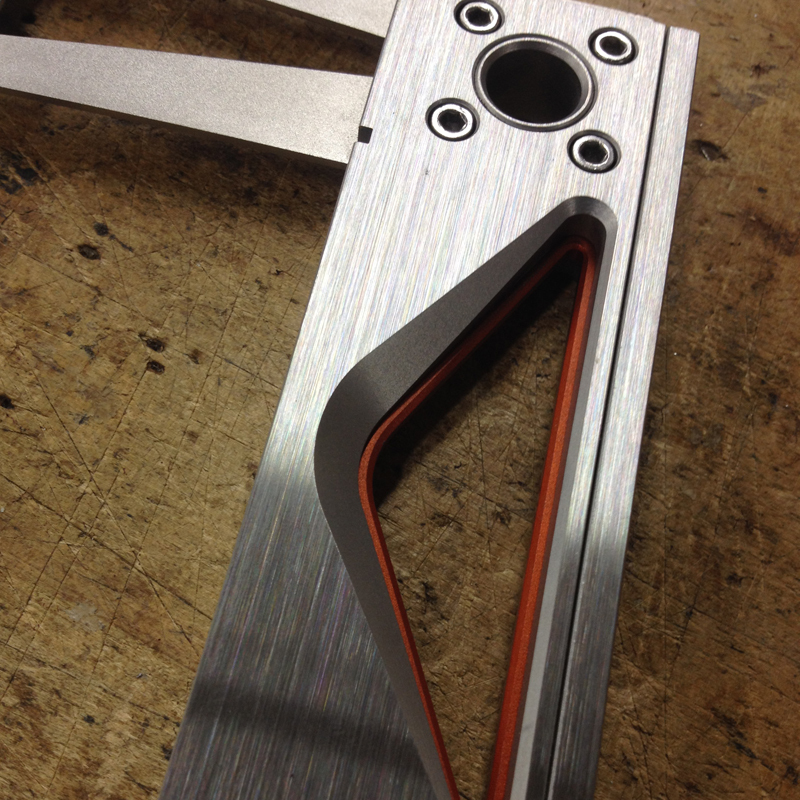 The orange and black inserts are anodized and done. 10/10/13 – We held off on the laser. We will laser after assembly. That way we know all is as accurate as possible. I am hoping that after assembly and packaging, that Mid November we can start shipping. The Assembly process will be interesting, mostly just because of the quantity. 10/24/13 – Stainless bodies are in hand and the Aluminum should be on Monday. November Shipping is still feasible. 10/31/13 – Our first fully assembled TS-2v2 below. Minus the grads on the blade. Pretty sweet looking square. Aluminum bodies are at the anodizer. Stainless at the bead blaster. .
11/14/13 – Anodizing on aluminum is done. 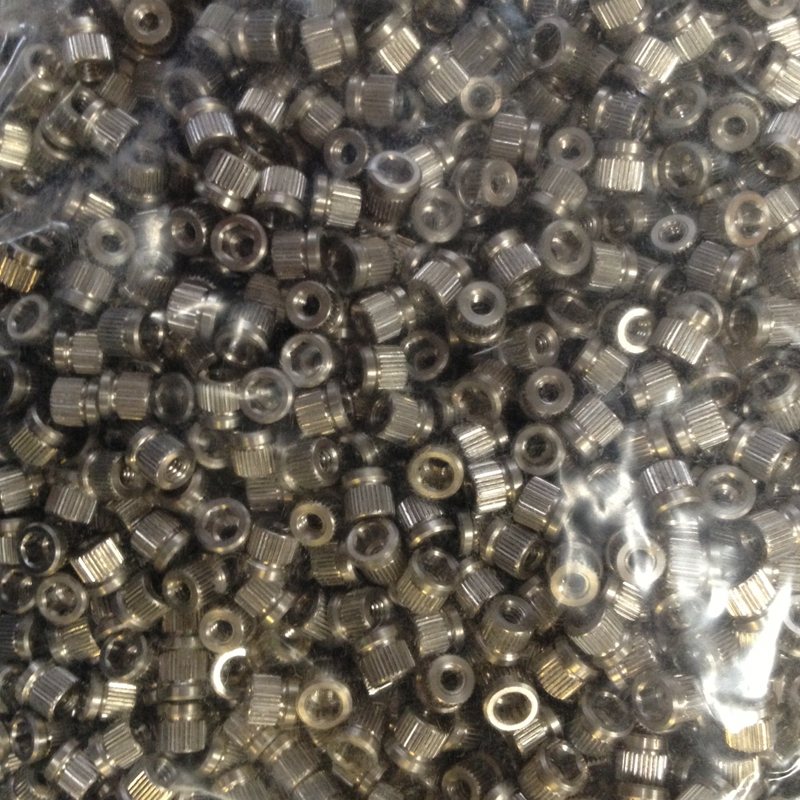 Bead blasting on stainless parts are done. Pressing in nuts next week. 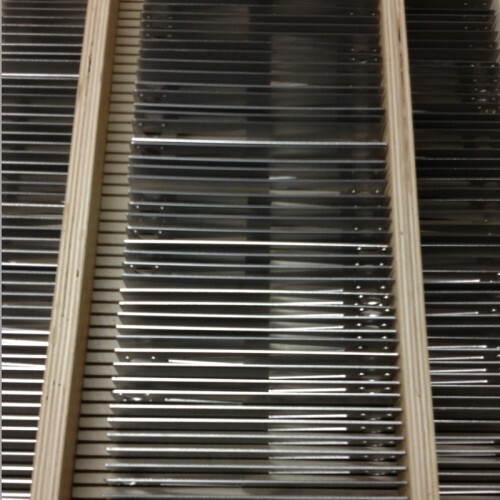 11/21/13 – The first batch of aluminum squares went to the laser facility. The stainless versions are being ground flat. These will not be back from the grinder until after the Thanksgiving holiday. The nuts and pins are being pressed in to the aluminum versions. Figures that the Swiss would need a machine for screwing. Pretty cool, though! FYI All: Michael Berg has left BCTW and we will not have a replacement until Q1 of 2014 due to my travel schedule. That said, all of the aluminum TS-2v2 are being lasered, and the SS versions will go to laser next week. They have all been set square, so when they arrive back from the laser house, all that is left to do is final inspection, box and delivered to our fulfillment facility. So real soon. In addition, we are doing a makeover to my blog and it has not gone as smooth as I would like but it is getting there – my blog is where the production updates occur.